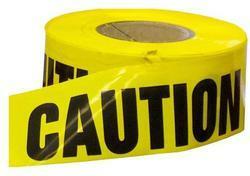 Pioneers in the industry, we offer caution tape from India. We provide customized as well as standard packaging of the products. With the assistance of our streamlined packing system, we are able to provide damage-free products to the clients. Purchasers can trust our entire range, as it adheres to global quality requirements and is highly reliable.